During the Russian Revolution, an idealist doctor, Yuri Zhivago (Omar Sharif, Lawrence of Arabia), falls in love with a beautiful girl, Lara Guishar (Julie Christie, Shampoo). Zhivago decides, however, to marry his cousin, Tonya (Geraldine Chaplin, Talk to Her). Years later, the doctor meets Lara again, and they realize that they belong together after all, but the war keeps getting in their way. Sprawling, hugely popular epic — not just a massive box office hit, but one of the most popular films of all-time. Doctor Zhivago was also a critical success, one of the best-reviewed movies of the decade. Although its grandiosity and fantastic visuals are an essential part of Doctor Zhivago, this is an intimate love story at its core. Robert Bolt (Lawrence of Arabia) adapted Boris Pasternak’s semi-autobiographical Nobel Prize–winning book. Director Lean instructed Bolt to tone down the politics and concentrate on the romance. A few critics accused the film of being overly romantic, but I think that’s precisely why the film remains as popular as ever — politics are divisive while romance is universal. 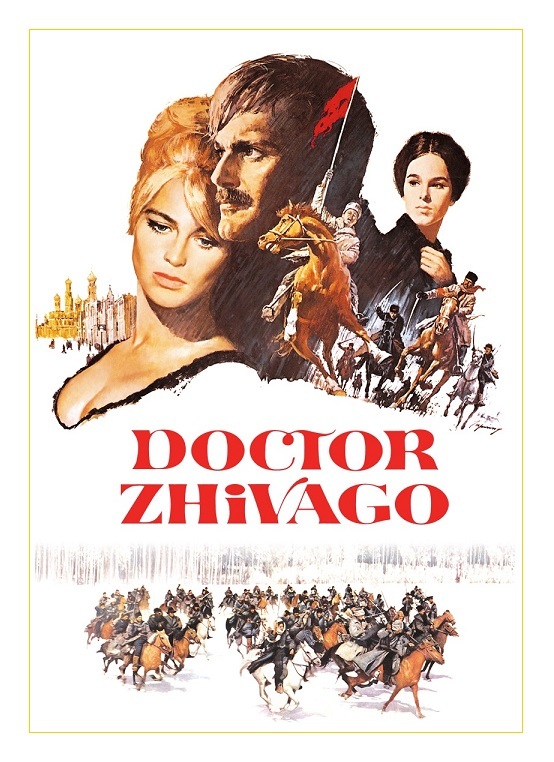 I’m sure Doctor Zhivago played better on the big screen, but if you have the proper home entertainment system, this is a great movie to watch on a lazy Sunday evening. My main issue with Doctor Zhivago is that the title character is not a terribly interesting person. He is a man of little action who is often swept away by the changes occurring around him. Omar Sharif does a commendably job, but he often comes across as being weak, even dull. I haven’t read the novel so I’m not sure who should get blamed for this flaw, but I do think Lean and Bolt should have tried a bit harder to make the character stand out, especially since he’s in almost every scene. Thankfully, most of the supporting characters are fascinating. My favorite is Komarovsky, played by Rod Steiger (In the Heat of the Night). You never know what he’s going to do next. Steiger does a great job bringing a very strange character to life. Tom Courtenay (The Dresser) is excellent as the conflicted Pascha. Courtenay impressed me on every level. Sir Ralph Richardson (Dragonslayer) is Zhvago’s adoptive father, and Sir Alec Guinness (Star Wars) plays Zhivago’s half-brother. And then there is Julie Christie. She has an ethereal quality that’s hard to describe. She reminded of a young Greta Garbo. She has not only great physical beauty, but also star quality. Christie ended up winning the Oscar that year for Darling, but I’d like to think that the award meant to reward both performances. Maurice Jarre’s (A Passage to India) majestic score — specifically “Lara’s Theme” — quickly became one of the most famous movie scores of all-time. Naysayers call it “elevator’s music,” but it is indeed a lovely melody. Everybody agrees that Freddie Young’s (Ryan’s Daughter) cinematography and John Box’s (Lawrence of Arabia) sets are superb — the movie isn’t pretty, it’s breathtaking! Despite its excesses and extreme length, Doctor Zhivago succeeds in developing a narrative that works inwards, pulling the viewer in. It’s not as good as Lean’s The Bridge on the River Kwai or Lawrence of Arabia, but every time I rewatch it I like it a little more. Color, 220 minutes, PG-13. Ahh … Guinness! I love his voice! Like the woman above said it is a gorgeous film. Everything is right in this film I re-visited it not long ago. Great story. It’s indeed a gorgeous film!